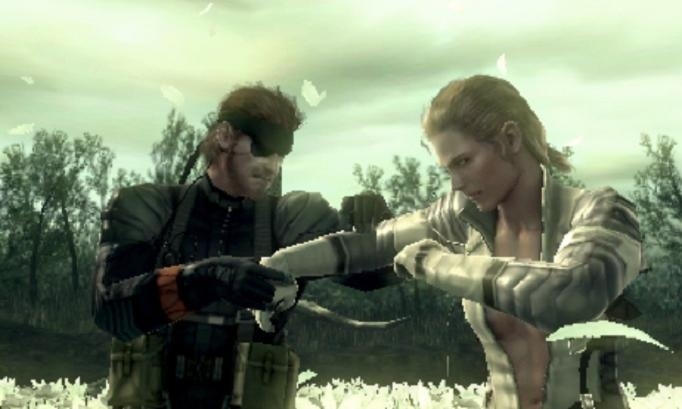 There are two schools of thought on Metal Gear Solid: Snake Eater 3D for Nintendo 3DS. One group believe that the PlayStation 2 game was never meant to be played on a handheld device, and that the evidence so far suggests that too little has been done to make the 3D update more friendly to those on the go. The other group can’t wait to have a portable version of the classic title, even if that means spending the entire length of one commute or another watching a single cutscene. It’s the second group that isn’t going to like today’s news: the release of Metal Gear Solid: Snake Eater 3D has been delayed until 2012. The news comes from Konami (confirmed by Kotaku), though that’s all the information we’ve got to go on right now. Other than knowing it’s coming at some point next year, there’s no indication of when that will be. Not even a window. You could argue that there’s a time limit on this release too; Kotaku correctly notes that an HD version of the game is coming to Xbox 360 and PlayStation 3. The 3D presentation of the portable version might not be enough to sway fans away from playing instead on a console (especially with Achievements/Trophies in the mix) if the two re-releases come out too close together. Fortunately for 3DS owners, there’s a solid lineup of games coming to the new platform this fall. First-party offerings like Super Mario and Kid Icarus: Uprising as well as third-party releases like Shinobi and Cave Story 3D. Lots to look forward to for the little handheld… just no Metal Gear yet.